In January 2019, Vietnam’s human rights record was reviewed at the UN Human Rights Council. In July 2018, CIVICUS together with Civil Society Forum, Human Rights Foundation (HRF), VOICE and VOICE Vietnam had made a submission to the Council assessing the civic space situation in the country. The government received 291 recommendations during the Universal Periodic Review (UPR) with at least 37 recommendation related to civic space. According to civil society, Vietnam “presented a grossly inaccurate picture of its human rights record” at the UPR and that the repression in the country has been severe. According to The 88 Project, there was an increase in the number of activists arrested and tried in 2018. 103 people were arrested for their peaceful political activities, up from 43 in 2017. As of December 2018, there were 210 political prisoners serving sentences in Vietnam. 2018 also saw intensified harassment of peaceful protesters as well as daily surveillance, travel restrictions, and physical assaults of activists. On 4th March 2019, Vietnam held the 8th round of its annual Human Rights Dialogue with the EU. Among the issues discussed include protection of fundamental freedoms and human rights defenders, including their right to freedom of movement. The EU also called on Vietnam to implement its UPR recommendations. Also, in March 2019, Vietnam’s record on civil and political rights record was reviewed by the UN Human Rights Committee. Among the issues raised include restrictions on the media, the use of restrictive laws to prosecute activists, torture and ill-treatment of human rights defenders and the lack of independence of the judiciary in Vietnam. Despite the scrutiny at the UN and by the EU, the persecution of activists has continued over the last few months. Some activists have been jailed or disappeared for their peaceful expression while others have been intimidated and harassed. Further, the draconian cyber security law came into force in January 2019. On 31st January 2019, a court sentenced three democracy activists to long jail terms after convicting them of criticising the authorities online. Vu Quang Thuan, Nguyen Van Dien and Tran Hoang Phuc, were found guilty of “spreading propaganda against the state” under Article 88 of the country’s penal code and handed sentences of eight years, six and a half years, and four years in prison, respectively. The three men had been arrested and tried for posting 17 video clips on Facebook and YouTube criticising Vietnam’s ruling Communist Party and government. According to their lawyers, judges denied the introduction of evidence during the trial, raising fair trial concerns. Further, family and relatives were barred from attending the trial. According to reports, plainclothes and uniformed police had guarded their homes for days before the trial to prevent them from traveling to show support. In December 2018, blogger and human rights activist Huynh Thuc Vy was sentenced to 33 months in prison for “insulting the national flag”. As previously documented, Vy was under investigation for defacing the flag of Vietnam, criminalised under Article 276 of the country’s 1999 Penal Code, after she smeared white paint on the national flag in 2017. The court decided that Vy, who was eight weeks pregnant with her second child, would serve the sentence after her unborn child turns three to give her time to nurse her baby, although she will be banned from travelling to other places and abroad. Amnesty International said that her conviction “amounts to an attack on freedom of expression” and is “a disturbing sign of the intensifying crackdown against peaceful dissent in the country”. On 28th December 2018, Vietnamese democracy activist Huynh Truong Ca was sentenced in southern Vietnam’s Dong Thap province to a five-year, six-month prison term for criticising the country’s communist government in a series of online postings. Ca was arrested in September 2018 after calling on social media for public protests. Ca refused to be represented at his trial by a lawyer, asserting his innocence and the right to defend himself. Huynh Truong Ca is a member of the pro-democracy group Hien Phap, a network of activists calling for rights to freedom of speech and assembly guaranteed by Article 25 of Vietnam’s constitution. Eleven other members of the group have already been arrested. On 20th March, a court in the southern Vietnamese district of Binh Thuy sentenced activist and Facebook commentator Le Minh The to two years in prison. Police in Binh Thuy arrested Le Minh The, a member of pro-democracy group Hien Phap, in October 2018 for his posts on Facebook. They held him incommunicado and charged him with “abusing the rights to freedom and democracy to infringe upon the interests of the state, the legitimate rights and interests of organisations and individuals” under article 331 of the penal code. Le Minh The’s Facebook posts had protested against the controversial cyber security law (see below) that would require internet companies to hand over user data and remove content if requested by the government. He had also criticised a draft law to grant foreign investors 99-year leases in special economic zones, a bill that sparked rare, nationwide protests in 2018. According to a report from The 88 Project, doctor and Facebook commentator Huynh Thi To Nga, who is also known as Selena Zen, disappeared on 14th February 2019, She was allegedly abducted and by plainclothes agents at her workplace . Nga is a lab worker in Nguyen Tri Phuong Hospital, and the single mother of two children who frequently posted her critical views on the government’s human rights abuses and widespread corruption. Adding to an already extensive list of restrictive laws in Vietnam that have been used to stifle dissent, on 1st January 2019, the cyber security law came into force. As previously documented, the law which was passed in July 2018 gives sweeping powers to the Vietnamese authorities, allowing them to force technology companies to hand over potentially vast amounts of data, including personal information, and to censor users’ posts. Many articles in the law are vaguely worded, allowing for broad interpretation by authorities. One article rules it a crime to post material online that “offends the nation, the national flag, the national emblem, the national anthem, great people, leaders, notable people, and national heroes". Thousands had demonstrated against the bill when it was before parliament in June 2018 and were faced with massive repression by the state. Amnesty International criticised the new law saying it would have “potentially devastating consequences for freedom of expression in Vietnam. In the country’s deeply repressive climate, the online space was a relative refuge where people could go to share ideas and opinions with less fear of censure by the authorities”. Brad Adams, Asia director at Human Rights Watch, said that “the goal of Vietnam’s proposed cyber security law appears as much to protect the party’s monopoly on power as to protect network security”. On 18th March 2019, five activists had their appeals of lengthy subversion sentences rejected by the Ho Chi Minh City high court. 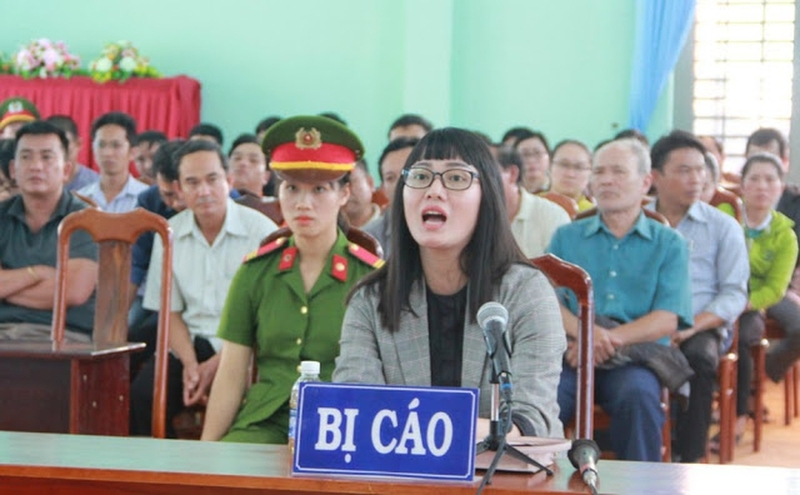 Luu Van Vinh, Nguyen Quoc Hoan, Nguyen Van Duc Do, Tu Cong Nghia and Phan Trung - members of the National Self-Determination Coalition - were appealing sentences ranging from eight to 15 years that was handed down by a lower court in October 2018. Luu Van Vinh’s wife, Le Thi Thap, was the only family member of the defendants allowed to witness the appeal hearing, while other relatives had to watch the proceedings on TV screen in another room. On 18th March 2019, activist and journalist Pham Doan Trang reported that the secret police was undertaking surveillance of her home. Pham is a member of the Vietnamese Magazine editorial board and a founding member of our Vietnamese site, Luat Khoa online magazine. According to Pham, since the Tet celebration in February 2019, the secret police began to monitor the home of her mother in Hanoi. Pham believes that the police were waiting for her to go back and visit her family during the celebration so that they could arrest her. However, because she did not go back to Hanoi, the secret police subsequently used different methods to locate her whereabouts. Hackers have also attempted to gain access to Pham’s Facebook on numerous occasions. As previously documented, in February 2018, Pham Doan Trang went into hiding after she was interrogated by security officials for over ten hours. She was questioned about a textbook she recently published as well as her news articles and blog posts on topics ranging from the environment, freedom of religion and online civil society. In November 2017 she was detained after meeting with the EU delegation in Vietnam. In the lead up to the recent summit between US President Donald Trump and North Korean leader Kim Jong Un held in Hanoi, it was reported that Vietnamese human rights activists and democracy advocates were kept under strict police watch. According to Radio Free Asia (RFA) activist blogger, Nguyen Lan Thang was under close watch by the police authorities at his home in Hanoi. Many others, including writer and activist Ngo Duy Quyen, and human rights lawyer, Le Thi Cong Nhan, also reported their apartment was being watched. Human rights advocate, To Oanh, told RFA that authorities installed cameras outside his home and closely followed him throughout the summit in Bac Giang province. In December 2018, government authorities in Hanoi raided a gathering of NGOs and abruptly shut down their annual civil society workshop. Eight civil society groups from the health, public administration and human rights sectors organised the two-day event which focused on the role of civil society groups in advising and engaging with the government on solutions to social issues. Local police entered the hotel where the event was being held and ordered organisers to shut it down, accusing them of violating a wartime decree from 1957, which stipulates that those who arrange a gathering of more than five people in a public place must inform local authorities of their meeting 24 hours in advance. As previously documented, mass nationwide demonstrations were held in Vietnam on 10th June 2018, including in the cities of Hanoi, Ho Chi Minh, Danang, Nha Trang and Binh Thuan. Police dispersed many of the protests with many being arrested and subsequently charged. Some demonstrators were beaten in custody.